1. A gorgeous weekend is ahead! Highs will generally be near 80° or so with lows near 60° in the city and back into the 50s outside the loop. Clouds will stick around, especially during the daylight hours this afternoon and tomorrow, but more sun will be expected on "Sun"-day. Humidity levels remain comfortable as dewpoints stay in the 50s. Open the windows in the evenings and pop that sunroof! There are also plenty of outdoor activities that you can take advantage of. 2. The cool temperatures of the past few days will give way to warmer air next week. Fortunately, we're not talking about a string of 90s, but mid to upper 80s for the middle of next week will be warm enough as humidity creeps back up just a a bit as well. Dry weather continues. 3. 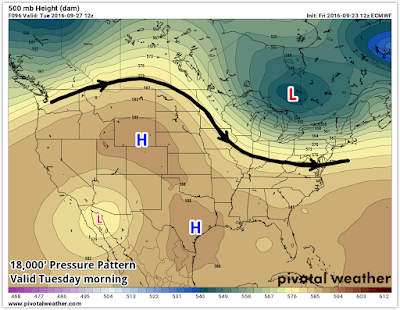 A cold front will move through mid-to-late next week (likely Thursday), which will bring our next chance of rain and possibly a few thunderstorms. 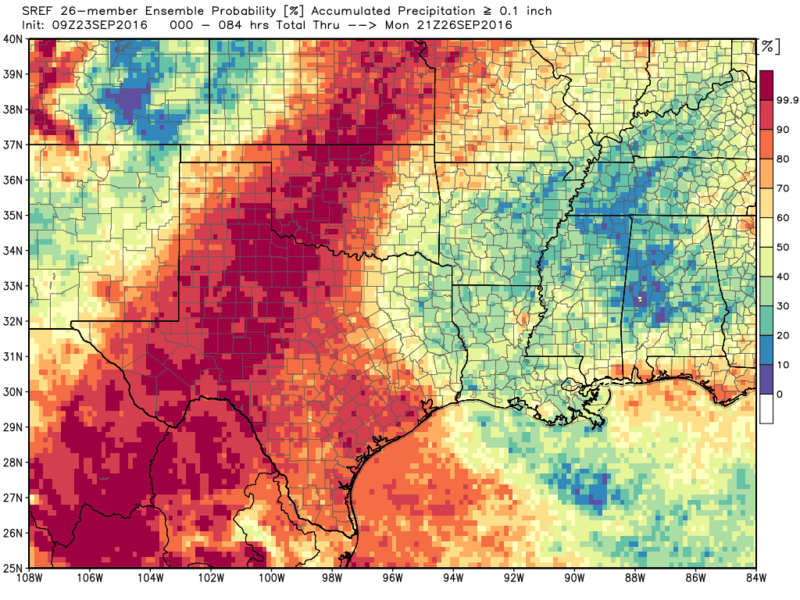 It looks to be a quick hitter though, so no prolonged rainfall is expected to help with our recent deficit. 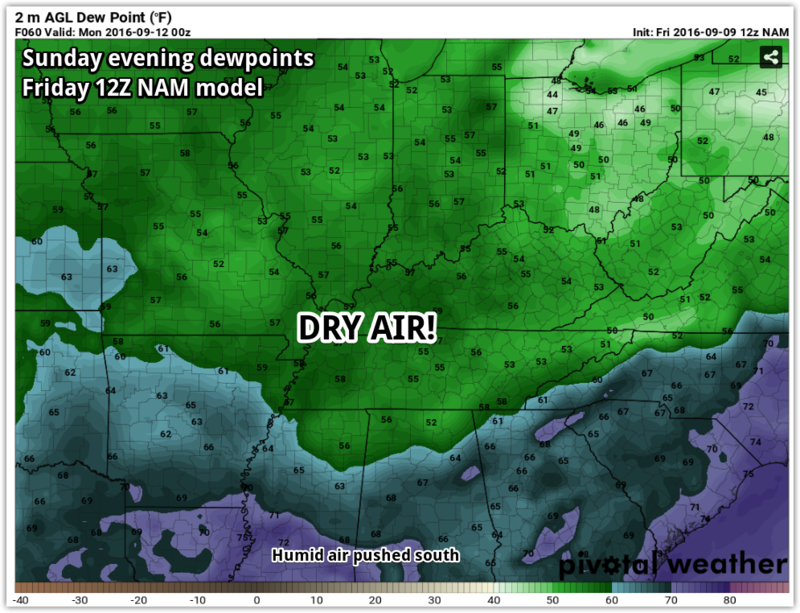 Behind it, slightly cooler and drier air again works its way into the Mid-South. 4. And as a bonus, outside the Mid-South, eyes are on Major Hurricane Matthew which is churning it's way through the southern Caribbean Sea. It's moving west off the coast of South America (yes, that is pretty far south for a Caribbean storm), but will make a hard right turn and head north towards Jamaica and Cuba early next week then into the Bahamas by the middle of next week. Significant impacts are possible in all of those locations as no noticeable weakening is expected until it interacts with the island of Cuba. It remains to be seen how much effect Cuba has on it. After the Bahamas, the east coast of the U.S. needs to keep a close eye on Matthew's track. Some models take it towards the Outer Banks of North Carolina, then turn it east, but it is still a long ways out from that. 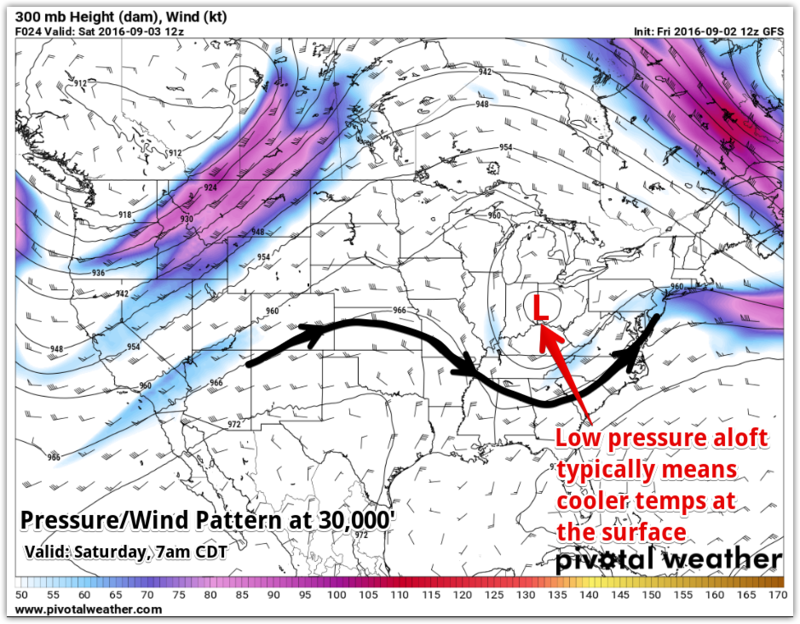 More detail can be found on the MWN Tropical Page. 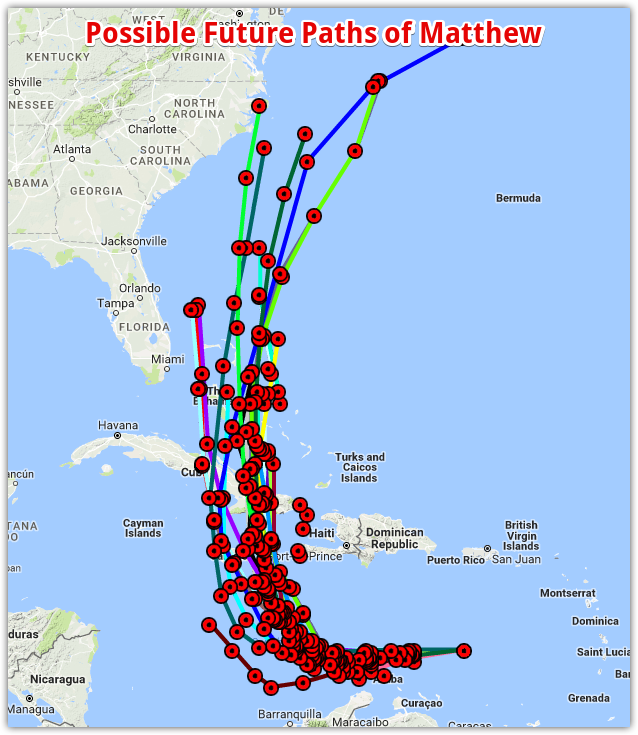 Based on the output of many meteorological computer models, the potential paths of Matthew are shown above. These "spaghetti plots" change routinely and are not all possible options. Rain for weekend activities? And what about this heat? I spent a very worthwhile several days in Norfolk, VA this week at the National Weather Association Annual Meeting. The NWA is one of two professional organizations for meteorologists, geared primarily towards operational forecasters. There were lots of great presentations and networking opportunities, but I'm glad to be back! 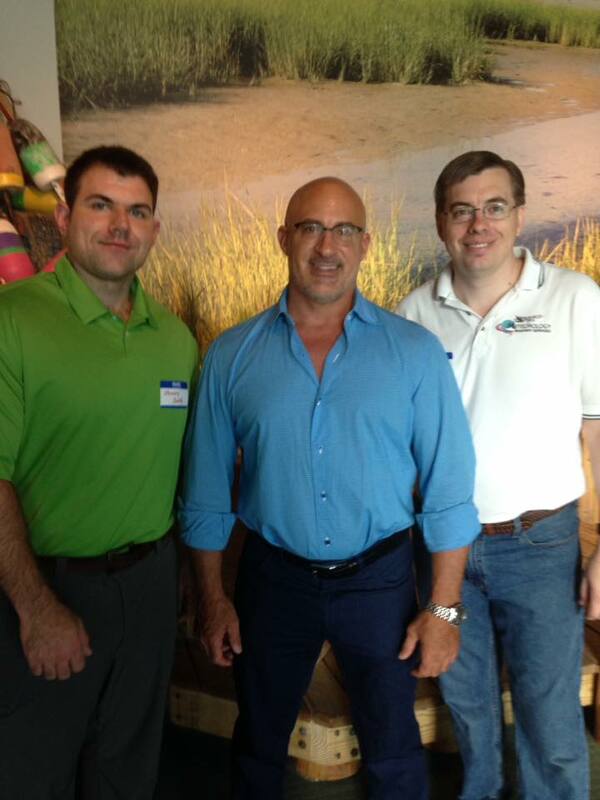 Here's one of my favorite pics - Jim Cantore really is a great guy! As we get deep into mid-September, it's about time for the heat to depart! 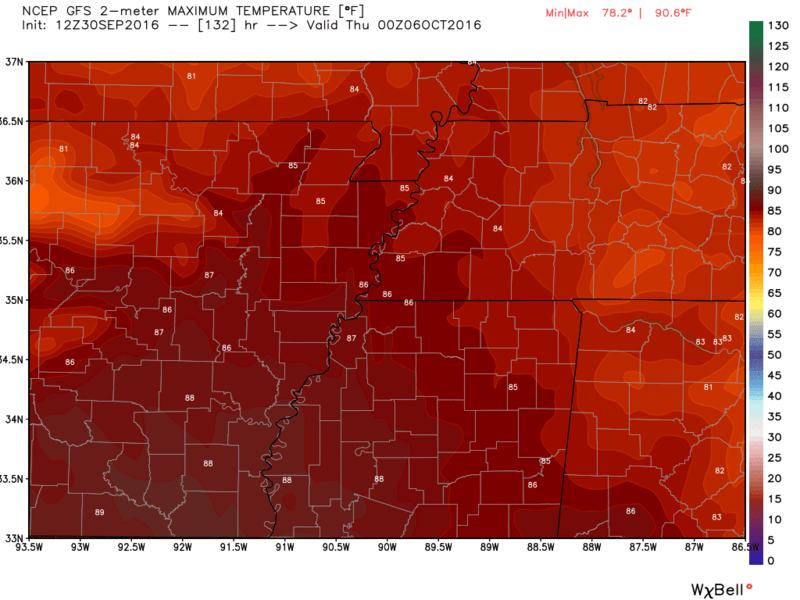 This week has been another cooker with highs in the mid to upper 90s. Fortunately, dewpoints have been a bit lower than when we had these same temperatures in the midst of summer, so heat indices have remained below 100 for the most part. As we head into a busy weekend for outdoor events, such as the Cooper Young Festival, a Memphis Tigers football game, and of course Friday night high school football, there are a couple of changes to the past week's pattern - a bit less heat and a bit more rain! Starting tonight, things are looking good, but warm, for football. Temperatures will settle into the 80s by dusk and rain chances are minimal. Wear your favorite school's t-shirt and leave the umbrellas at home. 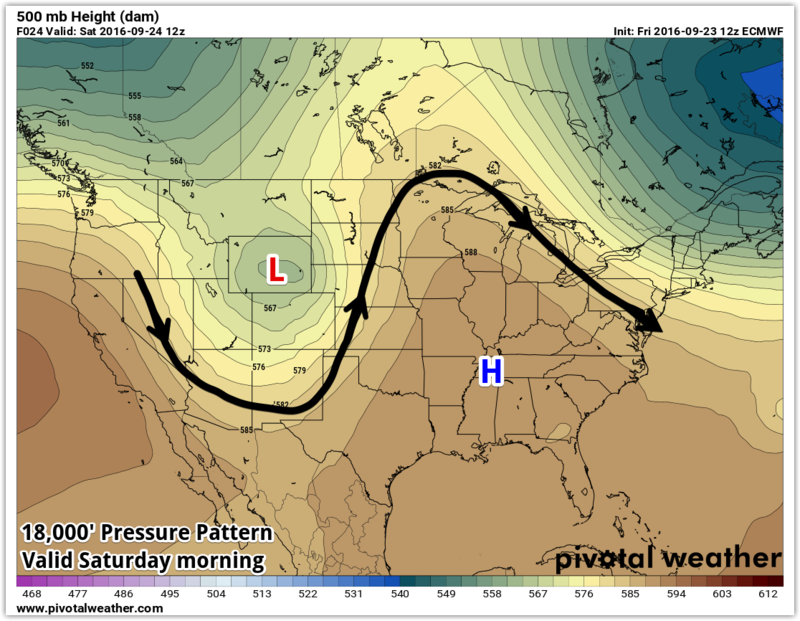 By Saturday morning, the ridge of high pressure that has dominated our pattern this week will move east as a large upper-level trough moves closer. That will push a front into the area and rain chances go up. There could even be showers around by dawn tomorrow, but the best chances look to be from mid-morning through early afternoon. Rain chances right now stand at about 50% but a complete washout is not expected. If you have plans to go to Midtown for either of the two big draws tomorrow, bring your poncho and have a good time, but expect some rain at some point and keep your eyes and ears open for lightning and thunder. 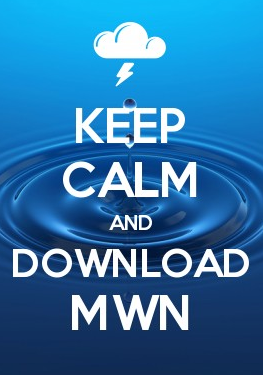 Your MWN app will come in handy, even though the NWS Doppler is down. Our radar will continue to show you what's headed your way. 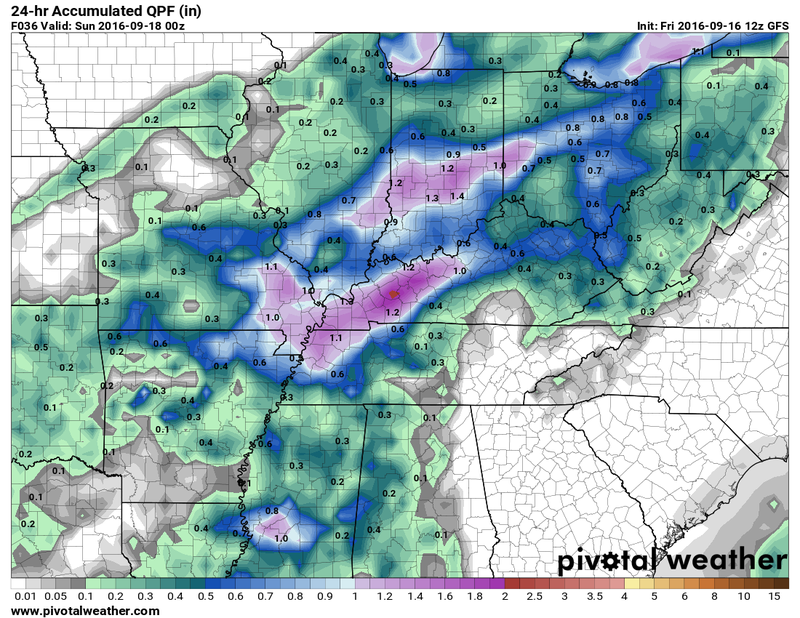 Rain amounts will generally be in the 1/2" range with some areas seeing a bit more or less. 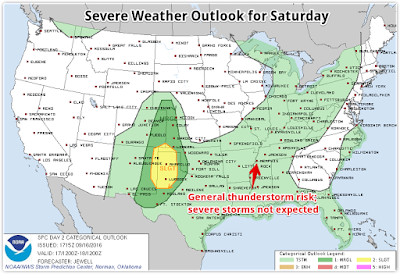 As mentioned, thunderstorms are also possible, but severe weather is not anticipated. 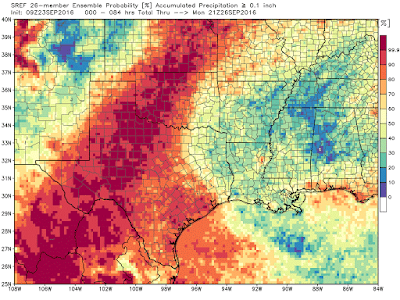 There's just not going to be enough upper level wind energy or low level instability to generate strong wind or hail. 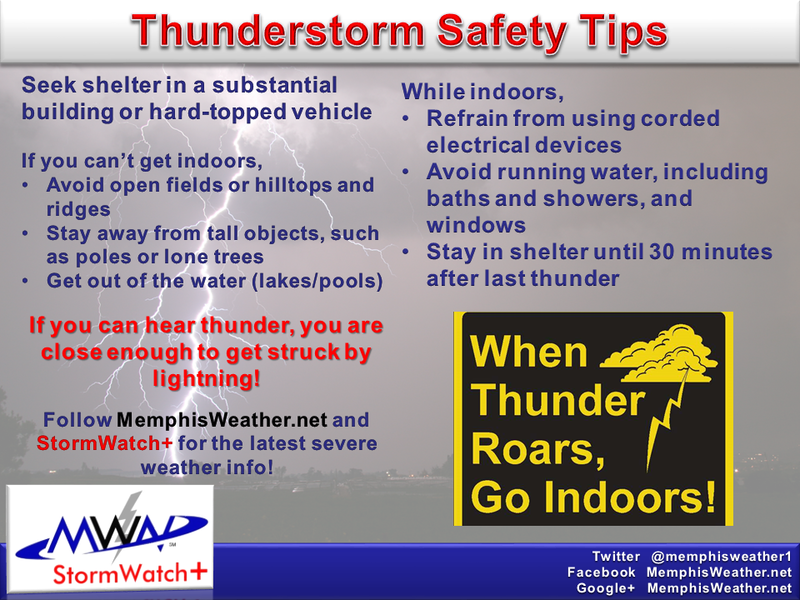 If lightning is nearby, take your lightning safety precautions. Your car is the best place to be if a sturdy structure is not accessible, but indoors is best. 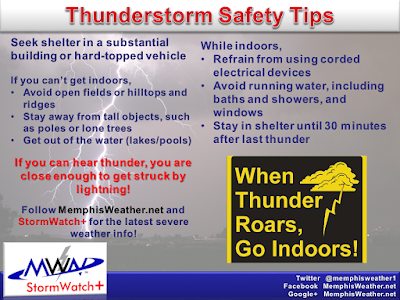 They'll put you on the concourses at the Liberty Bowl if lightning threatens, but trust me, that's only marginally safer than the exposed bowl. If you can find a way to get walls around and over you, that's better. Rain chances go down in the evening as the upper level wave responsible for the daytime activity moves east. Levitt Shell and other evening activities have a better chance of remaining dry than those earlier in the day, but a shower is still possible well into the evening. Sunday is questionable. 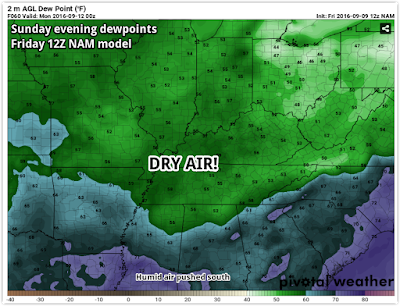 Some models dry us out, others hang some atmospheric energy back and keep rain chances in the forecast. 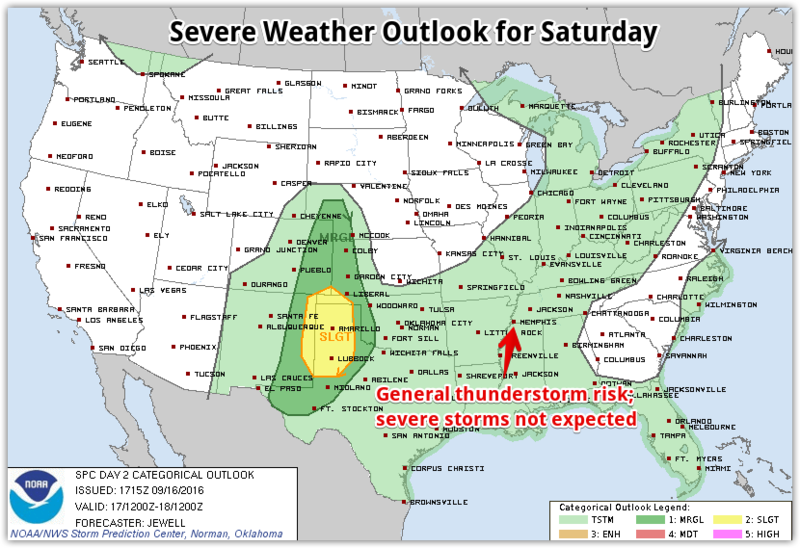 With the core of the upper level trough moving overhead, the prudent forecast maintains at least a chance of showers or a thunderstorm, which I have done. Probability of precipitation is 30-40% Sunday, subject to change. If you're picking the drier day this weekend for outdoor stuff, Sunday is your best bet. 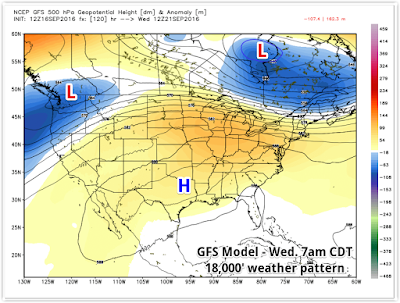 Heading into next week, unfortunately a summer-like ridge of high pressure builds over the central U.S. once again and we heat back up. The MWN Forecast is carrying 90's throughout the week with mid 90s quite possible in the middle of the week, and virtually no rain chances. The good news is that in the long-term (a week to 10 days out), I'm seeing a fairly strong pattern shift that should bring more autumn-like weather to the region for the end of September. It can't come soon enough! As we get deeper into September, the resumption of heat and humidity behind cold fronts that now arrive about once a week is slightly more bearable (though low to mid 90s is still too hot for this time of year). A sign of the times as we near fall! As we head into the weekend, another cold front pushes through with a rebound in temperatures behind it, but not quite to the extent of this week's 90s. 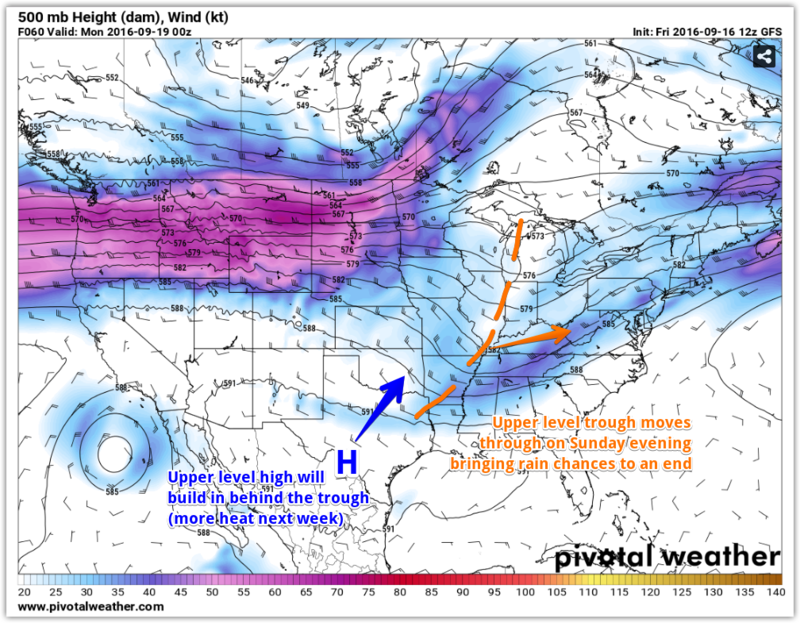 This weekend brings that next front, more specifically during the day Saturday. 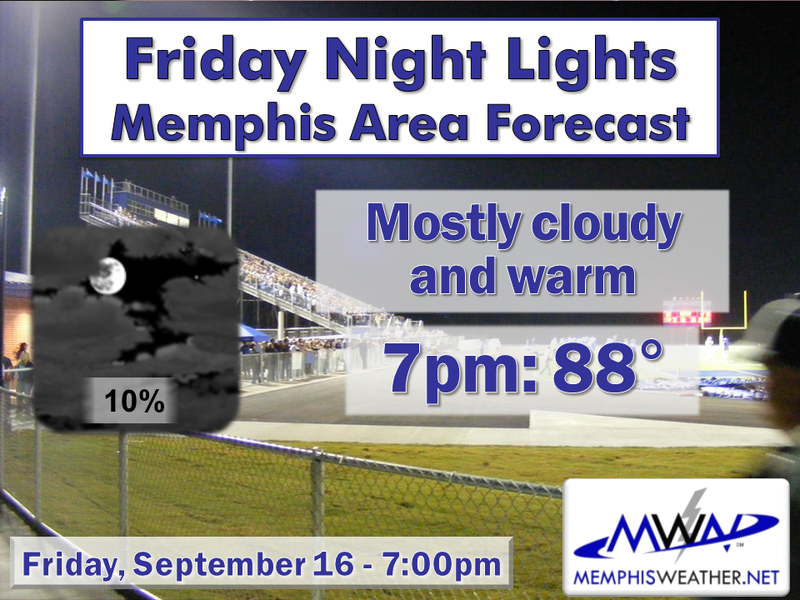 It will be accompanied by scattered showers and thunderstorms, with about a 40% chance of rain most anytime during the day. The additional cloud cover and scattered precip will keep temperatures in the 80s and wind will shift to the north by late afternoon. 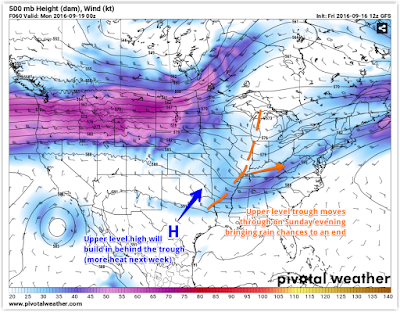 The effects of the front will be most pleasantly felt on Sunday and Monday with highs remaining in the mid 80s and cooler lows in the 60s, as well as low humidity and a sunny sky. If you have outdoor things to do, Sunday is going to be gorgeous! Heading into next week, we'll start to see a slight rebound in those temperatures back to the 90° range or so though humidity won't be oppressive. A couple showers are possible in the afternoon hours, especially mid-late week. 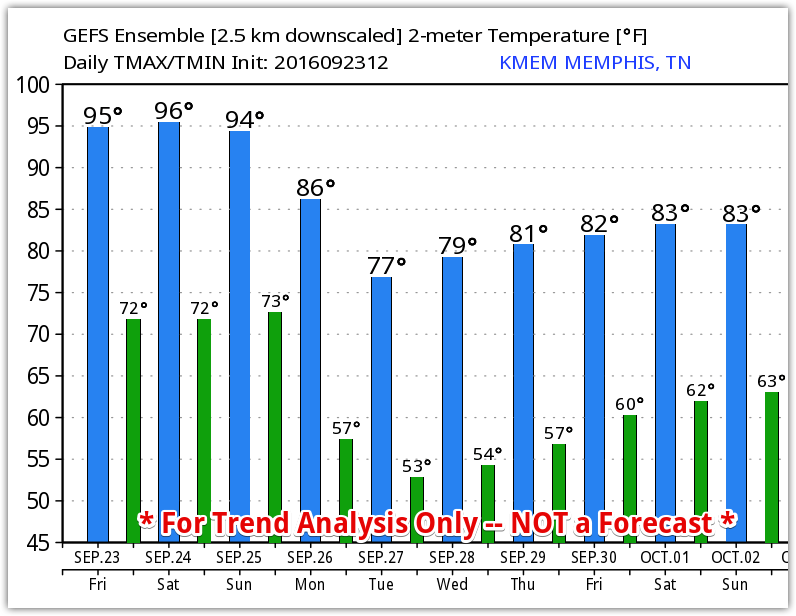 Yet another front looks to slowly drop in from the north late next week, bringing a slightly-cooler airmass than the preceding one. 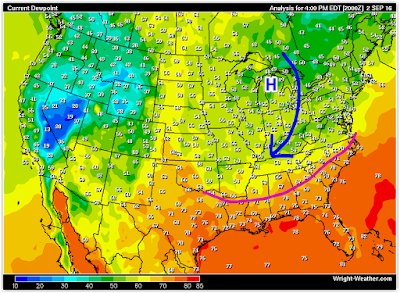 As mentioned above, it seems that each front starts to reinforce that fall is coming soon! I'll be in Norfolk, VA for the National Weather Association Annual Meeting this weekend and the first half of next week. It's a great conference with lots of learning and socializing with other weather geeks, as well as gaining continuing education towards the Digital Seal of Approval displayed below. Thanks as always to #TeamMWN for keeping the home fires burning! Have a great weekend! It's been a long time coming, but we've finally got some beautiful weather in the Mid-South! And not a minute too soon... because it's a holiday weekend! If you have outdoor plans this weekend (and who doesn't there's SO much going on), here are 5 things you need to know about our Labor Day weekend weather. 1. The streak is over! A couple weeks ago we ended lengthy (two-month-plus) heat streaks - one for daily average temperatures over 80° and another for high temperatures above 88°. This morning, the last summer-long warm weather streak came to an end. 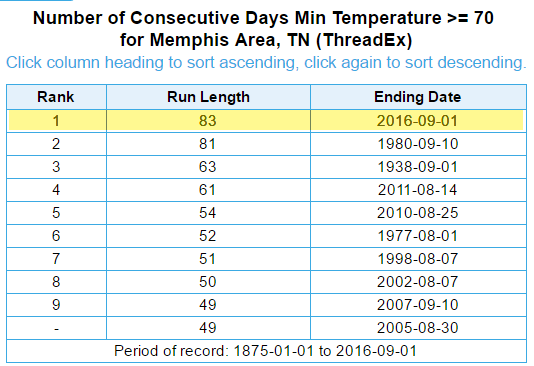 Until this morning, we had not had an official low temperature in the 60s since June 10. 83 days later, and after breaking the record on Thursday morning set in the scorching summer of 1980, that streak came to a merciful end as the low dropped to 68° at the airport. The dewpoint (a direct measurement of the amount of moisture in the air) is related to relative humidity, which tells us how "sticky" the air is, and drives things like low temperatures. It's one of two contributors to the heat index (temperature being the other). We've endured dewpoints well into the 70s most of this summer, which is very muggy, and coupled with temperatures in the 90s produces heat indices well above 100. A cold front that moved through Thursday afternoon has brought a nice northerly breeze and forced dewpoints down into the upper 50s this afternoon and it's like a breath of fresh air! 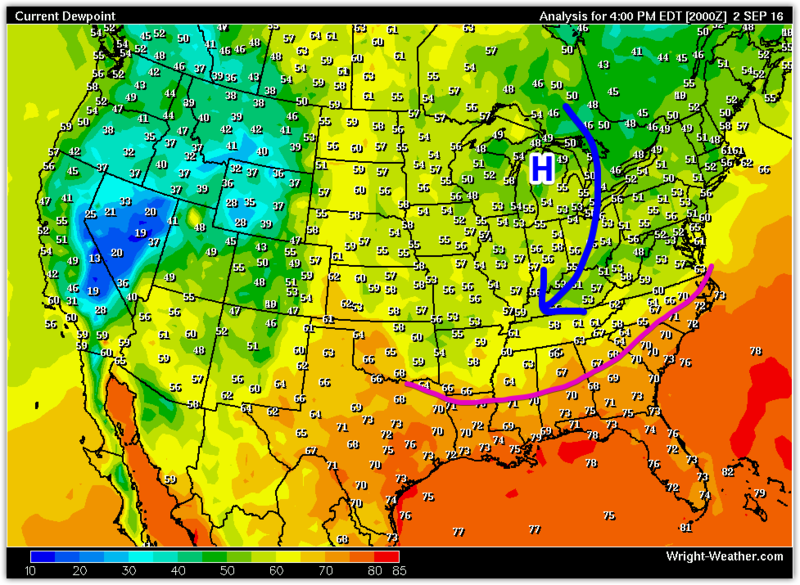 These cool dewpoints will stick around through Saturday before starting to rise again Sunday and Labor Day. That will mean cooler low temperature as well, making for very pleasant conditions through Sunday morning. By Sunday afternoon, dewpoints will be rising back through the 60s, which is a little more noticeable but still lower than we have experienced in some time. As you can see from the map above, high pressure is centered over the Great Lakes so it is cooler than high pressure centered over the Atlantic, like the "Bermuda high" that typically dominates our summer pattern. 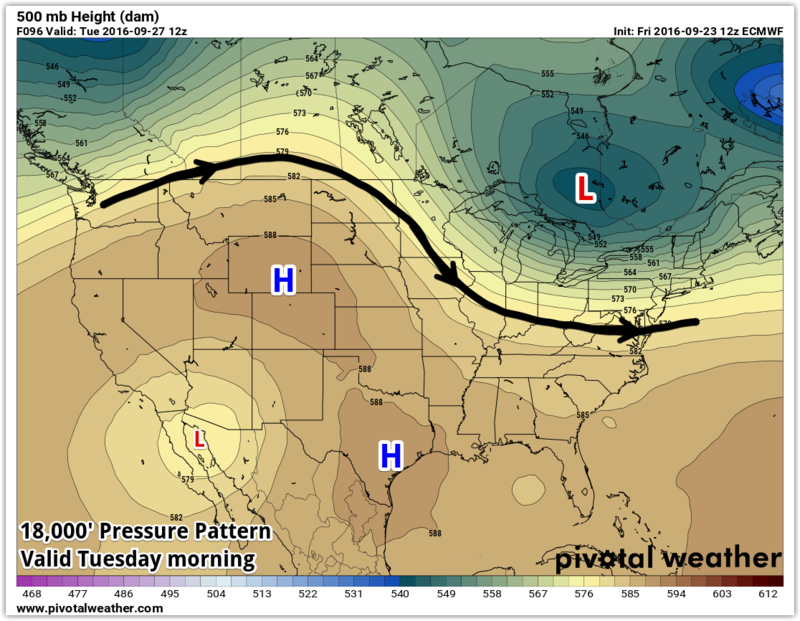 Coupled with the cooler surface high, the upper levels feature a trough of low pressure over the eastern U.S. We expect cooler temperatures under upper level troughs than upper level ridges (of high pressure). With the trough in place (which, coincidentally, has helped steer Hurricane Hermine northeast around its periphery), below average temperatures continue through Saturday with highs only in the mid 80s. As it weakens, temperatures start to rebound on Sunday and we'll be back to near or slightly above average temperatures in the lower 90s for Sunday and Monday. Not to be a "Debbie Downer" on this great weekend forecast, but as we head into next week, warmer high pressure at the surface and a ridge aloft will build back into the area as Hermine moves into the western Atlantic. The result? More warm weather and higher humidity, though not to mid-summer levels. 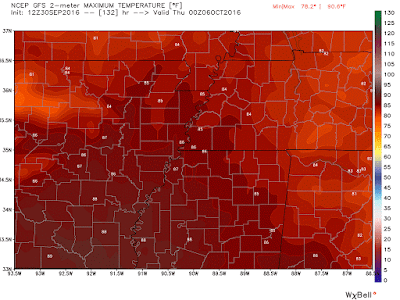 Most of next week will feature high temperatures that rise back into the lower 90s with dewpoints in the lower 70s. That's enough to get heat indices back up close to 100°. In addition, a few afternoon thunderstorms will be possible each day, especially the latter half of the week. 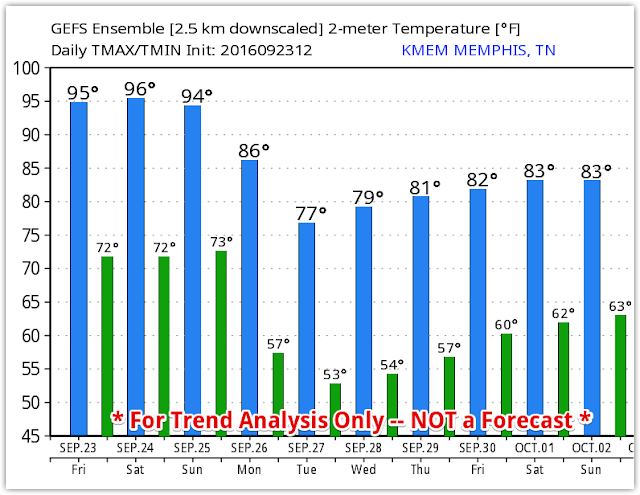 In the long-term, it looks like another front will move through next weekend (Sept 9-11 timeframe) that will once again cool us back down, hopefully this time out of the 90s for good! Hang in there! 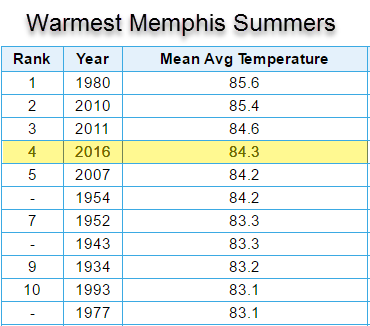 Fall is just around the corner, and after the fourth warmest "meteorological summer" (June-August) on record, it can't come soon enough! And with that, I'll just be going now... Happy Labor Day!